California African Americans are blacks sampled from California, where they compose about 6 percent of the state population. Twenty-six of the first 46 settlers of Los Angeles in 1781 were black or mulatto. The Black – California population data represent autosomal DNA samples from 100 African-American (African American) individuals in the state of California. 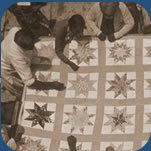 Photo Credit: Sloan Blanding; Quilting by members of a colored cooperative unit, Los Angeles, nd, Personalities and activities of the self-help cooperatives of California, BANC PIC 1905.17139:36– A. Copyright © 2004 The Regents of the University of California.